In 1951 Ludwik Gross reported experiments which demonstrated the viral etiology of certain murine leukemias. His work identified the presence of an infectious agent in cell-free extracts of AKR thymomas which could transmit leukemia to C3Hf/Bi mice (Gross 1951). Subsequent electron microscopic analysis demonstrated the presence of virus particles with the characteristic type c morphology of murine leukemia virus in both preparations of AKR thymomas and of leukemias induced in C3Hf/Bi mice by Gross’ protocol (Dmochowski and Grey 1957; Bernhard 1960). In the ensuing 30 years it has become obvious that the murine leukemia viruses (MuLV) are a polymorphic family of infectious agents, heterogeneous in their ability to induce disease in mice and even in their ability to infect and replicate in mouse cells (for review see Stephenson 1980). Host range classes of MuLV have been defined that are ecotropic, i.e., infectious for mouse cells, and xenotropic, i.e., infectious for cells of heterologous species but not for mouse cells. In addition, it has become clear that MuLV are maintained in the murine population predominantly via vertical transmission of endogenous viral loci carried by the mouse genome, rather than by horizontal transmission of infectious virus. These viral loci consist of complete and partial viral genomes, the expression of which can result in production of infectious virus or in synthesis of viral gene products in the absence of virus replication. 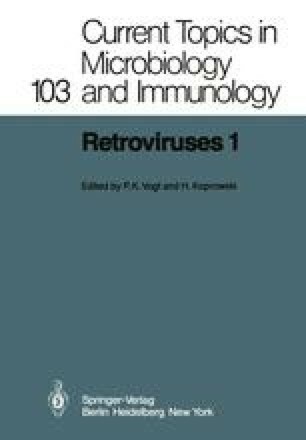 A great deal of effort has been directed toward characterization of the repertoire of MuLV that exists in the mouse, and toward identification of the factors which influence the complex virus-host interaction which governs their expression in vivo (for review see Lilly and Pincus 1973; Old and Stockert 1977; Jolicoeur 1979). One outcome of these investigations has been the identification by Hartley and co-workers (1977) of the particular class of leukemogenic MuLV which Gross assayed in his early experiments.